It's starting to green a little. I even saw the first dandelion leaves on my yard today. Thread crochet in bright colors is light, summery and casual. 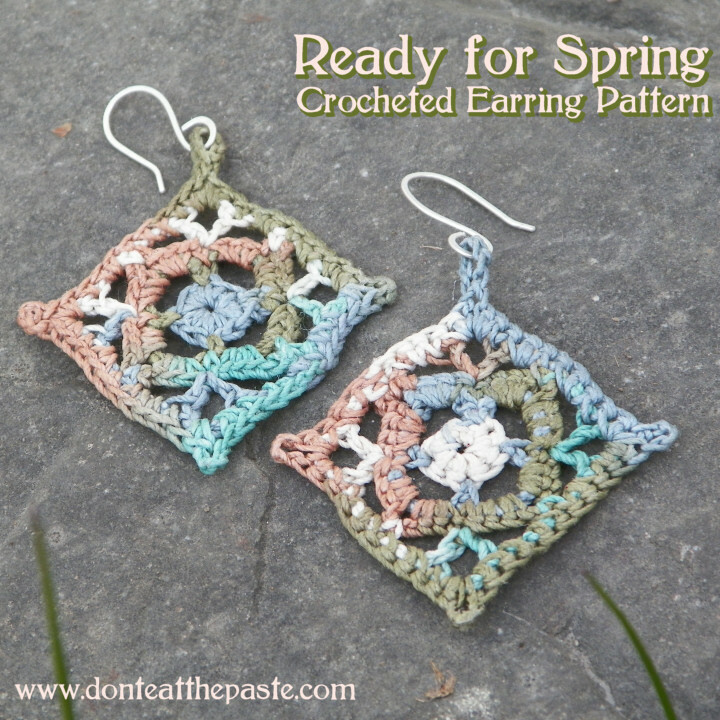 These earrings work up really fast and I hope you enjoy the pattern. Pattern written in US terminology. Round 3: ch 1, sc in loop 3 times working toward sc from previous round, sc in sc, sc in next loop 3 times, ch 3 (picot made), sc in same loop 3 times, sc in sc from previous round., Repeat around until the last ch 3 picot, ch 1, dc in first sc to join. Round 4: ch 1, sc in picot, ch 3, skip 3 sts, dc in next st, ch 5, dc in same st (V stitch made), ch 3, sc in next picot. Work in pattern all the way around, sl st to first sc to join. Round 5: Ch 1, sc in same st, sc 2 times in first space, sc in dc, sc 3 times in ch 5 loop, ch 7, sl st to join at the 6th ch from hook, ch 1, sc 3 times in same loop, sc in dc, sc 2 times in next space, sc in sc, sc 2 times in next space, sc in dc, sc 3 times in ch 5 loop, ch 3, sc 3 times in same loop, sc in dc, sc 2 times in next space, sc in sc. Repeat until you're at the first sc and sl st to join. Break off thread and weave in ends. I mixed the Mod Podge half and half with water in a small pill bottle, then soaked both earring pieces in that solution. Squeezed it out, and then pinned to block on a plastic covered piece of cardboard. As soon as it was mostly dry, I unpinned it and turned them over to let the other side dry more completely, then let the Mod Podge cure for 12 hours and put them on the earring wires. This stiffens it up nicely and still shows stitch definition and the thread very well. The earrings wires that I used are made with 20 gauge sterling wire that I shaped around a dowel for the hook, then used bail pliers to make the ring. After that I hammered the wires to harden them and add a nice bit of slightly flattened shaping to them. I'm planning to make more earrings, would you like more earring patterns? Thank you for sharing! Beautiful! so lovely earrings!I'll like to try to make it! 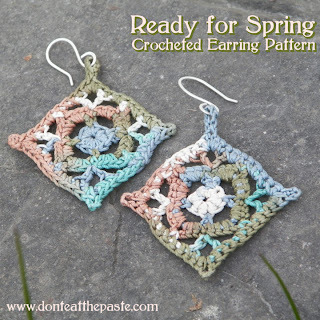 These are beautiful, I'd love to see more earring patterns from you! Thank you so much for posting. Is it just me, or does anyone else not like the way stiffing the earrings makes them feel. Scratchy. They are worked in rounds, kind of like miniature a miniature doily or granny square.